Marks & Spencer's has recently launched a new personal shopping and styling service called Tuesday. 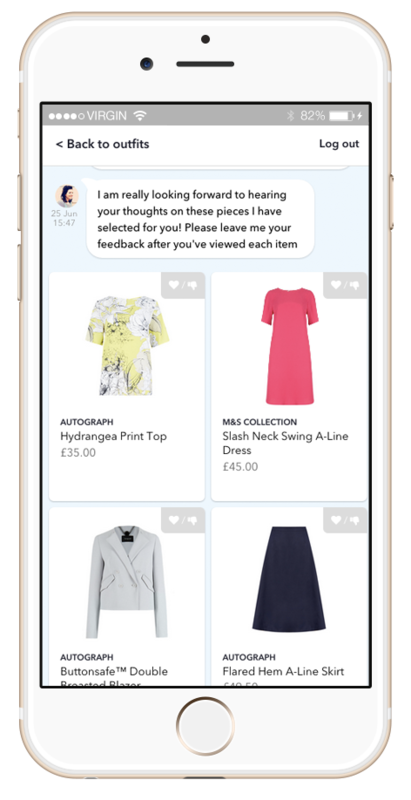 Named after the top browsing day of the week and developed by the M&S Venture Lab, Tuesday offers customers convenient personal styling and shopping advice. After signing up online you arrange a call back time with your specially paired up stylist. Speaking to them on the phone is fun - you get to talk about what clothes you like, what styles, colours, give them more info about your size, body shape and what kind of thing you are looking for. I have a couple of Christmas parties coming up so asked my stylist Alison (who has a great voice and is super friendly) for ideas on what i could wear. A couple of days later i got an email and link to the (very user friendly) website, where Alison had selected some clothes for me, giving suggestions on how they could be styled and what they could be worn with. There was also a space for me to comment on each of the items and give feedback. I was slightly apprehensive about using this service - seeing as i am pretty sure what i like to wear and every time i have done something slightly similar to this they have got it wrong. However I was very impressed - Alison did a great job, she showed me things that i would have otherwise over looked and gave suggestions and ideas of different ways to style things such as - adding ribbons instead of laces to a pair of cool brogues (that i might have to get/ am getting!). Once your stylist knows you, they keep everything on record so if you have another event or need help with your wardrobe they can look up what you have already and advice you from there. Tuesday was easy and fun, i would definitely recommend it - especially if you are short of time, aren't able to get to the shops and need help with what to wear! Tuesday is kind of like online shopping with a well qualified mate, who is entirely focused on you and what you are looking for. I can't wait to call Alison again (even better than she'll definitely know who i am! ).